The River Tana is a huge watercourse with a lot of tributaries of different size and characteristics. The Atlantic salmon has through thousands of years evolved to the different environment in the tributaries, and made the salmon population as diverse as it is today. Just as long as the salmon has been in the river, people have harvested this rich resource. The Atlantic salmon in the River Tana has created the unique Sami culture. The diversity of the River-Sami culture is presence e.g. in the language. A traditional way of fishing – by weir (foto Kjell-Magne Johnsen). 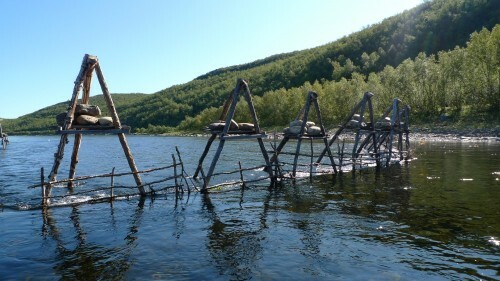 The River Tana is one of a few rivers in Norway where people (local inhabitants) still are allowed to catch salmon with nets. The net fishing is allowed on the background of both common law and the Norwegian law of fishing in the River Tana. The different kinds of nets used are divided into active (drift net and seine) and passive (weir and gill net) equipment. Fishing with weir is the oldest tradition. There are different terms for net fishing in Finland and Norway. In Norway the fishermen have to farm at least 2 000 kg hey each year, or the same amount of other kinds of forage. In Finland the rights of fishing with nets are based upon the size of people’s property, and inheritd rights. Common at both Norwegian and Finnish side of the border is that the each fishermen have their right of fishing with nets only in a section of the river. Anglers who live in Tana and Karasjok municipal have a legal right of angling in the Watercourse. Anglers who live close to the anadromus tributaries of river Tana in Kautokeino municipal have the same right. Their right is also build upon common law. Visitors are also welcome to angle in the River Tana. Only Norwegians are allowed to angle in the Norwegian tributaries. There is a long tradition of angling in the River Tana. According to historical sources a primitive way of angling was used long before the English lords introduced the art of angling in the 1850`s. 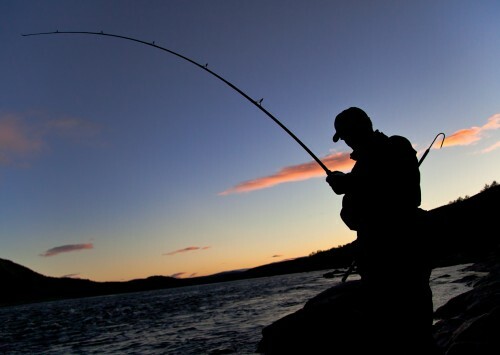 Today angling represents an important source of recreation both for locals and visitors.